Growing up on a farm instilled in Michel Nischan a deep appreciation for sustainable agriculture and those who work the land. 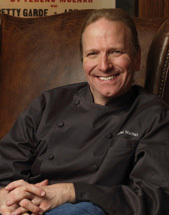 In addition to his role as chef and owner of Dressing Room—A Homegrown Restaurant, located on the grounds of the Westport Country Playhouse in Connecticut, Michel served as The Victory Garden's resident chef. It was through his advocacy for a more healthful, organic, and sustainable food future that Michel came to know Paul Newman's daughter, Nell, the driving force behind the creation of the organic division of Newman's Own® products. When Nell Newman learned of her father's plans to become involved in a restaurant she introduced him to Michel. Newman and Michel found their beliefs on food, family, and community to be remarkably aligned, and Dressing Room evolved as a place where their shared values could have a common home and expression. In keeping with their altruistic natures, a portion of Dressing Room's proceeds are used to support the adjacent Westport Country Playhouse, the establishment of culinary scholarships and apprentice programs for inner-city children and a community-based edible mentorship program. In addition, Newman and Michel are the impetus for the Westport Farmers Market, the town's first greenmarket open every Thursday from June through October. Newman and Michel were spotlighted in the "Person of the Week" segment on the November 24 broadcast of ABC World News with Charles Gibson for their community outreach efforts with Dressing Room and other planned activities. Michel is credited with creating a cuisine of well-being, focused on pure, local, organic ingredients and intense flavors, without the use of highly processed, overly indulgent elements. The inspiration to explore cooking for well-being began in 1994 when his five-year-old son Chris was diagnosed with juvenile diabetes. "Chris' illness made me realize that floating on foie gras and bathing in butter might not be in the best interest of my customers," said Michel. Michel introduced his groundbreaking new cuisine in 1997 at Heartbeat restaurant in Midtown Manhattan's W Hotel, and was immediately propelled to the forefront of New York's culinary scene. Since then, he has continued to raise the bar for delicious and healthful cooking and is lauded for his dedication to organics, sustainability, and cultural food preservation. After years of focusing on healthy, sustainable and culturally significant cooking causes, Michel decided to put his methods down on paper, writing two well-received cookbooks, Homegrown Pure and Simple: Great Healthy Food from Garden to Table and Taste Pure and Simple: Irresistible Recipes for Good Food and Good Health. Taste was listed as a bestseller in The New York Times andThe Wall Street Journal, and won a 2004 James Beard Foundation Cookbook Award. The Victory Garden's "Homegrown" segments featuring Michel won a 2008 James Beard Foundation Media Award. Michel resides in Fairfield, Connecticut, with his wife, Lori, and their five children.